Coca-Cola has a new ad in which a young girl wishes to grow a garden for the whole world. Then, as a grown woman who works for Coca-Cola, she says that she’s fulfilling that dream. The phrase “feed the world” is one that should always be questioned, because it’s often used to promote the selfish aims of corporations that want to produce and sell as much food as possible — without regard to whether that food actually reaches the hungriest and most vulnerable people on the planet. But, putting that aside, the sentiment is even more laughable when it’s touted by a beverage company. Coca-Cola has a long history of selling its flagship product by playing on people’s emotions. Coke drinkers associate the product with America, fun, family, and sports. In perhaps its most brilliant move, the company found a way to get Coca-Cola to the U.S. military while they fought in World War II in Europe. American servicemen and women got a precious taste of home while fighting a grueling foreign war, and Coca-Cola got their lifetime brand loyalty — and the opportunity to build up a bottling infrastructure across Europe so they could expand internationally after the war. The new ad provides Coke drinkers with the warm and fuzzy feeling that their beverage of choice is helping the poor. There are two problems with this idea. First, soda in particular is bad for you. Especially when one has limited or no access to medical care — the plight of many poor people here and abroad — maladies like diabetes and tooth decay can be catastrophic. In Appalachia, dentists refer to something they (unfortunately) call “Mountain Dew mouth.” In that region, a quarter of preschoolers already have tooth decay. By age 18, more than one in seven have already had a tooth extracted because of the problem. Second, the idea of “feeding the world” is usually based on the idea that the world doesn’t produce enough food to feed everyone. But that’s not true. We do produce enough food — more than enough — to feed the planet’s entire population. We just don’t distribute it equitably. About 40 percent of the food in the U.S. is wasted, even while people in our country go hungry. But even if production were the problem, if we were to get serious about using our agricultural resources to produce as much food as possible, then one way to do so is to stop wasting agricultural resources to produce things we don’t actually need: sodas, wine, beer, coffee, tea, cut flowers, and so on. I am not saying that nobody should drink soda, or that Coca-Cola should stop producing it. Let’s just be honest about what it is. 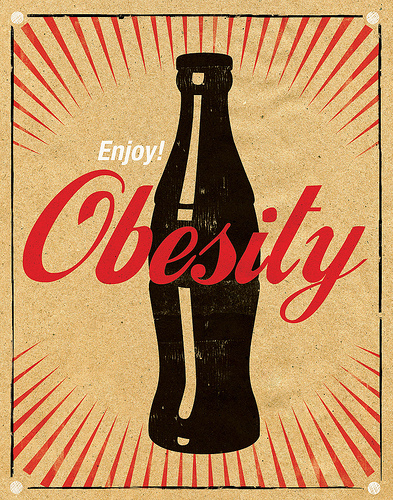 It’s a sugary drink that provides no nutrition, and you may drink it because you enjoy it.